Honeywell HFD-010 is a very old air purifier, marking the first ifD air filter as well as starting a product line of tower air purifier. Thanks Honeywell for sending us a testing unit of this Honeywell HFD-010, which is now only available in White edition. Now, it’s time for a Honeywell HFD-010 Review. If you are looking for the Honeywell HFD flagship, you should look for Honeywell AirGenius 6. We do give honest reviews (both pros and cons) so anyone will guarantee to have the wisest choices. We do not (and never) exaggerate one product just to let you click the links and buy that product blindly. 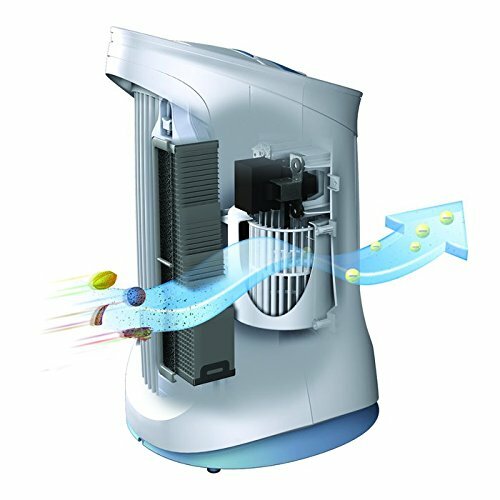 As a big air purifier corporation in the world, Honeywell has released more than 30 specific air purifiers, with two biggest lines of products – the HPA Model and HFD Model. If the HPA Model is typically powerful with great True HEPA filter, especially featured in Honeywell HPA600B – latest flagship of this brand, the HFD Model emphasizes more in the appearance. However, that doesn’t mean there is no “new” technology in this Honeywell HFD300. Well, let’s find out in our Honeywell HFD-010 Review. 1, Honeywell AirGenius 6 HFD360B Review. 2, Honeywell AirGenius 5 HFD320 Review. 3, Honeywell AirGenius 4 HFD310 Review. 4, Honeywell AirGenius 3 HFD300 Review. 5, Honeywell Compact AirGenius 4 HFD280B Review. 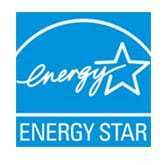 8, Honeywell 50250 & 50255B Reviews. As the first of its kind, the Honeywell HFD-010 is a little bit higher price for the performance rating. However, it’s not all bad news for Honeywell owners in terms of value. The Honeywell HFD-010 retains its value better than any other air purifiers. This means you can get back a lot of the original outlay by selling, on eBay for example. The original price tag of Honeywell HFD-010 is $99, and now reduces to $88 due to its old age. For the performance, it’s advised to buy the Honeywell HPA020B or HPA060, because both of them are the True HEPA air purifiers of this brand. Or if you like more air filtration process, you should look for GermGuardian AC4825 or GermGuardian AC4150, with UV-C air filtration technology. Now let’s get to the nitty gritty of what the Honeywell HFD-010 is really like. 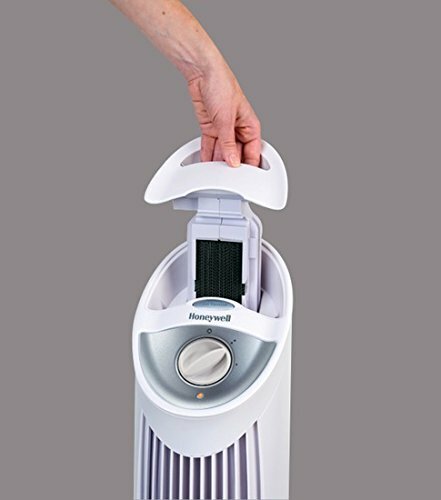 Honeywell HFD-010 QuietClean Compact Tower Air Purifier. Patented ifD filter captures up to 99% of ultra-fine particles from the air passing through the filter. Only below $100. 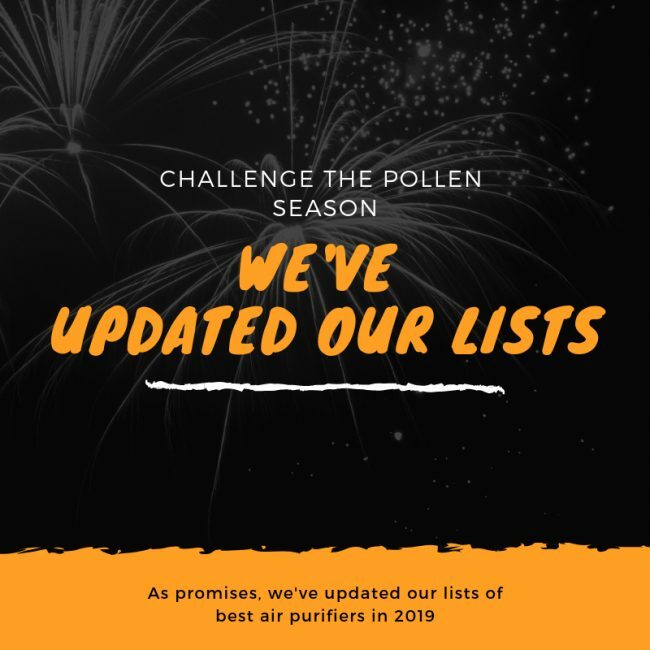 Related post: Best air purifiers in 2019. This Honeywell HFD-010 originally has two editions: Black and White. But you can’t find the Black version in Honeywell Store website, as they stop the old model for a long time ago. Our testing unit is a White version, with the same design and size as the Black. Most striking about the Honeywell HFD-010 is its new design. If you are looking at the old models of Honeywell, like Honeywell 17000-S or Honeywell 50250, they are totally different with this Honeywell HFD-010. While the front air grill is classic Honeywell with plastic material and single color, the whole body is now a tower-shape one, with 16.7 inches in height. Combined with the new back-to-front air flow system, this design gives the air purifier maximum capacity for its fan, increasing the efficiency of Honeywell HFD-010. To my mind the concept is sound and we really like the exceptional fit of this air purifier when putting the Honeywell HFD-010 anywhere in my home. The Honeywell 17000-S and Honeywell 50520 are like huge machines required lots of space, but the Honeywell HFD-010 is only 9 inches in depth and 11 inches in width. That size is really what makes the Honeywell HPA060 so popular, and in fact, it starts with the Honeywell HFD-010. On top of this air purifier, there is one manual switch to change the fan speeds. Also, you can easily take the air filter out as below. Honeywell HFD-010 weighs only 7 lbs, and can be easily moved around your home. Related post: Best air purifiers for bedroom. As the first using the ifD air filter, you can purchase separately one optional pre-filter for this Honeywell HFD-010, to make a 2-stage air cleaning system as below. Pre-filter – The Honeywell pre-filter CZF-2179 is actually an Activated Carbon filter to help deodorize the air and reduce the odors. ifD filter – Honeywell HFD-010 uses ifD air filter, with Breakthrough filter technology to capture 99% of ultra-fine particles from the air that passes through the filter. This air filter is permanent and washable. Not like the typical True HEPA filter, Honeywell HFD-010 makes use of the ifD filter, which stands for Intense Field Dielectric. This air filter is a breakthrough, permanent filtration method that is highly effective against all types of airborne particles which are larger than 0.3 microns. It works when a high voltage source actively charges the filter and forces particles to be captured in the physical layer of filtration. There is only one problem, the actual performance of this Honeywell HFD-010 is low in real-world use. Using an old technology of ifD air filter, I don’t expect much from this Honeywell HFD-010. But what could you expect from an under $100 air purifier? However, due to the core nature of this air filter is just an ionic air filter, it can produce a trace amounts of ozone, and therefore can irritate asthma or other breathing issues. If you have these breathing problems, you should not buy this air purifier, because Honeywell HFD-010 doesn’t have any on/off button for ionic feature. Well, the ifD air filter is permanent to use, but in case you need to replace it, you need to contact Honeywell. At the moment, there is no deal for the filter replacement of this Honeywell HFD-010, and therefore, I will hesitate to purchase one in the future. Especially when Honeywell stated clearly as “To ensure stated product performance, use only Genuine Honeywell Replacement Filters”. Okay, because I can’t search the “Genuine Honeywell Replacement Filters” for this Honeywell HFD-010 anywhere. Related post: Best air purifiers for allergies and asthma. You should remember that this air purifier is only below $100. A cheap air purifier like Honeywell HFD-010 will never cover a large room, and actually the room coverage is only 62 sq ft. For a same price range, the Honeywell HPA020B and HPA060 are much better. The ACH of Honeywell HFD-010 is only 3x. It can clean your room every 20 minutes. The CADR of Honeywell HFD-010 is 35 Dust/ 40 Smoke/ 55 Pollen (cfm). With such low CADR rating, I highly recommended to choose Honeywell HPA020B for better performance. Related post: Best large room air purifiers. However, without True HEPA filter is somehow an advantage. The Honeywell HFD-010 is extremely quiet, providing it has a very low fan power. So if you are looking for an air purifier in quiet places, such as your office or bedroom, Honeywell HFD-010 is a good choice for you. Related post: Best air purifiers for office. 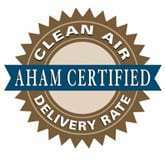 One of our most FAQs is “Do air purifiers use a lot of energy?”. In fact, we need to run an air purifier for a long time to be efficient. With 40W as power consumption, the Honeywell HFD-010 is one of the best Honeywell air purifiers for not consuming much energy. Its power consumption is only 1/3 the maximum of Honeywell HPA300, which is one of the best air purifiers in 2019. For using a Honeywell HFD-010 8 hours per day, it would cost you up to $15 per year. Related post: Best air purifiers for pets. Again, it is sad but true, Honeywell HFD-010 is an old model of this brand. Commonly, Honeywell isn’t well-known for making the smart air purifier, and you won’t notice such benefits from the Honeywell HFD-010. If you are looking for a Smart flagship air purifier of Honeywell, you need to look for Honeywell HPA 600B. 1, Best air purifiers for smoke. 2, Best air purifiers for dust. 3, Best air purifiers for mold. Honeywell is a leading brand in air purifier market, but they don’t offer a friendly customer service as others. You can reach them via mailbox of Honeywell Store in 407 N. Quentin Road, Palatine, Illinois. But I suggest you should call them at 847-701-3038 for any support questions. Or you can email to sales@honeywellstore.com for any problems you experience while on the site or after buying a product. Honeywell is available from Monday to Friday. They don’t have Free Shipping like Rabbit Air or Alen, and you must notify them within one business day for any problems with third-party shipping service like USPS or FedEx. Otherwise, they won’t take responsibility for any merchandise damage in transit. Also, the shipment can take up to 10 business days from the date that the order is shipped. The hardest part is when you want to return one Honeywell air purifier, as you only have 30 days from the date you receive your item to process your return. You won’t receive the shipping charge (on both the original shipping charge and the return shipping charge) and must pay a 10-30% re-stocking fee if there is no damage caused by transit or workmanship defects. The warranty policy of Honeywell is also among the longest to guarantee against all defects, with up to 5 years warranty. If you have one Honeywell HFD-010 in your home, it’s time to consider buying a new one. If you are looking for a new air purifier, and you only have $100 budget, you really should go for Honeywell HPA020B, or change the brand and buy GermGuardian AC4825. These air purifiers are meant to be living in 2019 better than the Honeywell HFD-010. Should I buy Honeywell HFD-010? No, an investment in the Honeywell HPA020B or Honeywell HPA060 is a lot better, as they have the high-quality True HEPA filter. If you have serious allergies or asthma to airborne pollutants: the Honeywell HFD-010 has an ifD air filter, which is not as good as the True HEPA filter. If you want a better performance, or better fan power to clean your room faster: you can search for the Winix C535, Winix 5300-2 or Winix 5500-2. If you need an air purifier with a better room coverage: you can choose the SilverOnyx, Winix 5300-2, Winix C535 and Winix 5500-2, as they can clean better than this Honeywell HFD-010. If you need a budget version of this air purifier: you can go for the Honeywell HHT270W. If you need a more silent air purifier: you should get the Levoit LV-H132 or Blue Pure 411. If you care about the annual filter cost and energy cost: the Honeywell HFD-010 has the most affordable air filter for the price. If you love the additional features: you can get the AeraMax 100 for the Smart Sensor. An old model and should be discontinued anytime soon. A runner, cat lover, gamer, beer enthusiast, techie, blogger. I believe in "The Giver Gains" so I write to give you the benefits you deserve to have.